PHUKET: -- Seven people were rushed to hospital after an explosion erupted on board a Phuket fishing boat queued up to take on ice at Por Pichai Company wharf, in Rassada, yesterday. Phuket City Police were notified of the explosion at 8:10am and rushed to the scene along with Kusoldharm Foundation rescue workers. 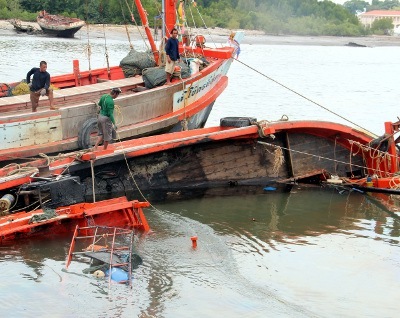 At the scene, rescue workers found the Sathaporn 7 half sunk and seven men injured. The captain, Prawai Tongmee, 52, and a man identified only as “Mr Nikorn”, 37, suffered severe burns and were unable to speak. Five Burmese crewmen were also injured in the blast. All seven were rushed to Vachira Phuket Hospital in Phuket Town. From their initial investigation, police believe that after the Sathaporn 7 finished unloading its haul of fish at the nearby Fish Marketing Organization wharf on Saturday, it queued up to take on ice at the Por Pichai wharf for its scheduled departure yesterday. While waiting in the queue, a crew member turned on the gas cooker, which might have had a leaky gas hose that fuelled the explosion, said police. The blast damaged the engine room and holed the hull, causing the boat to list and partially sink into the shallow water. The Sathaporn 7 was salvaged yesterday. The owner estimates repairs will cost about 2 million baht. Norraset Roay-utara, 39, who owns the Sor Chock Anada, which helped salvage the Sathaporn 7, said, “It took us a while to salvage the boat, since it is big. But we knew how to deal with it: we just tied buoys to the boat and let them float it to the surface. “Then, we patched the hole and dragged it back to the wharf to be repaired,” he told the Phuket Gazette. Police are continuing to investigate the case to determine the exact cause of the explosion. Ah, those damned Burmese again! Bloody foreigners.